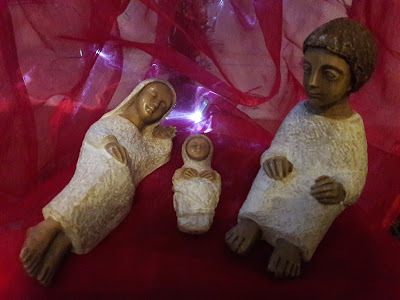 Traditional cribs, like the one I inherited from my father, often show Mary and Joseph kneeling and gazing at their newborn God in prayerful adoration. More modern ones, like the one we had at 11NG, tend to have Mary - often seated - cradling Jesus, while Joseph stands protectively by. So the crib being used this Christmas by my community - bought in Jerusalem thirty or so years ago, and given to one of our sisters - is somewhat unusual. It is also very human and realistic, in the figures' postures and the attitudes they suggest. Mary lies, in post-birth drowsy bliss, sleepily contemplating her newborn baby, as billions of mothers have done throughout the ages: as those of my friends who are mothers can recognise as something they too have done, in a powerful, quietening rush of joy, pure love and adoration. Joseph sits, his gaze fixed, staring straight ahead. I fancy he looks rather dazed, as any brand-new father would, as he contemplates the enormity of his new responsibilities. He's a young lad, barely older than Mary, thrust into adulthood by this entrusted paternity. And he's sitting. Maybe he isn't yet ready to stand guard; maybe he needs to steady his trembling knees and gather his strength - or maybe he just wants to be on the floor too, as close to Mary and Jesus as possible, savouring this time with them, and his own post-birth rush of heart-melting love. They may not be kneeling, hands folded in prayer, yet there is a prayerful quietness about these figures, a stillness born of contemplation, and intimacy with the tiny One whose presence has so radically changed their lives. The bustle and noise of labour and birth have happened; the busyness of responsibility and care and so much to do will start soon enough - but for now, there is just stillness and simply being. And may we too, in these coming days so often filled with busyness and bustle, find our own opportunities for stillness and simply being, and for intimacy with the One whose presence has the power and grace to transform our lives - and through us, to transform our world, if we but let him.